I found Tom's project on Flickr by total accident. Apparently, he was sent the link on how to make the gadget gloves and made two pairs for Christmas last year. Tom ran into a bit of a snare with the sewing. 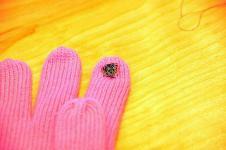 This is because it is harder to sew a perfect straight line when you have knited gloves. With knitted gloves you can do a series of knots to make a little ball of thread at the end of your finger instead of the straight stitches suggested in the tutorial. Great job Tom. 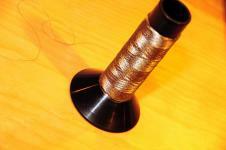 I know you have some thread left over, so get to making some for this year too!